One person in New York has died from Legionnaires' disease amid a new cluster that emerged in a Bronx neighborhood this month, health officials said Wednesday as they announced the total number of cases connected to the current outbreak increased to 13. The death was announced two days after health officials said they were investigating the new cluster in Morris Park, which the officials said is not related to the outbreak that sickened more than 120 people, killing 12 of them, in the borough over the summer. Initially, the city said it was investigating a cluster of seven patients. Two days later, the patient total had nearly doubled. Officials say patients in the current cluster live or work in Morris Park and range in age from 45 to 75; 11 individuals remain hospitalized and all have underlying health conditions. Thirty-five cooling towers in the area were tested for Legionella bacteria, and 15 of them came back positive. They are located at the Chase bank at 2725 East Tremont; Calvary Hospital at 1740 Eastchester Rd. ; Lehman High School at 2964 East Tremont; Bronx State Psychiatric at 1500 Waters Pl. ; Einstein College at 1199 Sacket Ave., 1845 Eastchester Rd., 1865 Eastchester Road, 1925-35 Eastchester Road and 1301 Morris Park Ave.
All locations were ordered to begin cleaning and disinfecting immediately, officials said. Speaking in the Bronx Wednesday, Mayor de Blasio stressed the current outbreak is different from the one that erupted in the south Bronx over the summer, becoming the largest outbreak in New York City history. This is "different than what we experienced a couple of weeks back. This is a much more limited situation," the mayor said. "We're going to be very vigilant, be very careful." "The danger is not getting medical attention. That is the singular danger,” de Blasio added. A spokesperson for Eintstein College of Medicine said Montefiore and Einstein have been compliant with all required health department cooling tower testing standards. "Despite these efforts, the most recent water test conducted by the DOH showed detection of Legionella," the spokesperson said. "In coordination with the DOH, we are treating the towers to eliminate harmful bacteria in these water sources, sanitizing the area regardless of the results, and will continue to take every precaution to protect students and staff." 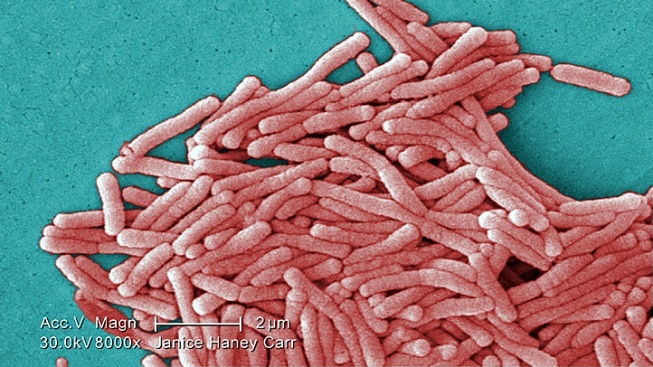 Authorities have added three more cases to a new cluster of Legionnaires' disease that has emerged in a Bronx neighborhood, bringing the total number of patients to 10. Ray Villeda reports. Lehman High School has turned off the air conditioning as it disinfects the towers to remove the "trace amounts" of Legionella, according to a Department of Education spokesman. The water in the cooling tower is self-contained and separate from the water used by the school. Classes remain in session. A town hall will be held in the neighborhood Thursday to address residents' concerns. Health Commissioner Mary Bassett said Monday the city was working to determine the source of the outbreak and taking immediate steps to protect the people who live and work in the area. Bassett urged anyone with flu-like symptoms, including fever, cough and headache, to seek care immediately. She said all patients developed the disease prior to Sept. 21, when the first case in the cluster was reported. The deadly outbreak over the summer, which was the largest outbreak in New York City history, was linked to a cooling tower at the Opera House Hotel. In that outbreak, which affected the south Bronx, at least 128 people got sick; a dozen of them died. Those who died had underlying health conditions. Concerns about prevention and safety prompted the city to develop and pass new legislation to regulate cooling towers, one of the locations where Legionella, the bacteria that causes the potentially severe pneumonia-like disease in people who are exposed to it, is likely to grow. Health officials say they are investigating a cluster of seven Legionnaires' disease cases in one Bronx neighborhood, but the cluster is not related to the outbreak that sickened more than 120 people, killing 12 of them, in the borough over the summer. Ida Siegal reports. Under the new legislation, cooling towers across the city must be tested regularly for Legionella bacteria; any found to be contaminated must be disinfected immediately. The regulations specify penalties for violations, and the legislation makes New York City the first major city in the United States to regulate cooling towers. Prior to the recent outbreak, no city records were kept as to which buildings had cooling towers. The cooling towers in Morris Park had recently been cleaned in line with the new regulations, city officials said.